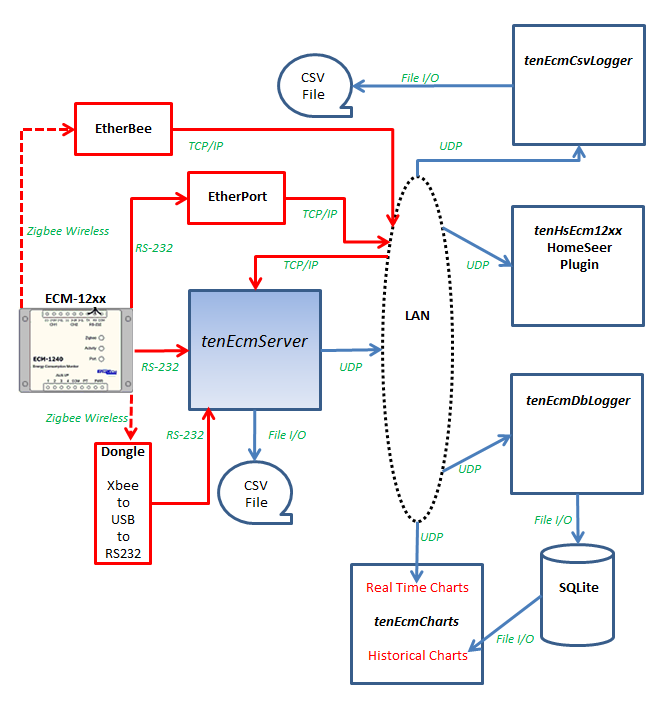 tenEcmServer connects to one or more Brultech ECM-1220 or ECM-1240s (up to five) and receives energy consumption data via either a serial port and/or via TCP/IP (using the EtherBee or EtherPort). tenEcmServer then broadcasts the ECM data to one or more computers on your network. This allows you to run multiple programs that all utilize realtime data from the ECMs. For instance, tenEcmServer provides the data to the tenHsEcm12xx HomeSeer plugin. The Brultech power monitor connects to your electrical panel and continuously measures the amperage and voltage, computing energy consumption. It makes this energy data available to your computer via an RS-232 serial port, or via TCP/IP using the EtherBee or EtherPort. The ECMs support setting the frequency of data transmission from 1 to 255 seconds. You can also specify a trigger threshold that will cause a packet to be sent whenever the power changes by the specified watts, even if the time period has not yet expired. For instance, you can specify that you want to receive a packet every 10 seconds, unless the energy consumption changes by more than 100 watts -- in which case a packet will be sent immediately. These parameters are set using the Brultech IA utility. The original ECM-1220 can monitor up to two main power lines. The newer ECM-1240 can monitor an additional 5 circuits. tenEcmServer automatically adjusts to either model based upon the received data stream. The ECM-1240 can also be set to send the ECM-1220 data format. tenEcmServer broadcasts each received packet to all computers on your network. You specify the UDP port(s) to use, and all client programs listen on one of these ports. The data is sent in easily processed Comma Separated Value (CSV) ASCII format. You could have several client programs running on one or more computers using the same ECM data, such as: A HomeSeer plugin on your HomeSeer server, a data logger that archives all of the power data to a database, a realtime chart running on several panels around your home showing the last 30 minutes of energy consumption, etc.